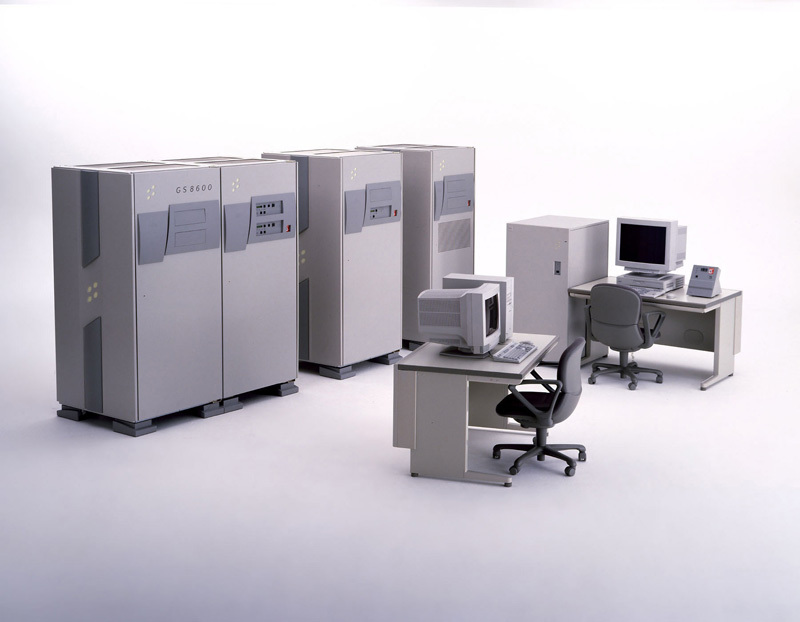 The GS8000 series was Fujitsu’s new mainframe computer series running on standard CMOS*1 processors. Fujitsu announced two model groups (GS8400 and GS8200) in May 1995 as successors to the M-1000 series. Fujitsu added the high-end GS8600 model group in January 1996. The GS8600 models used a CMOS processor with 1.7 times the performance of those on the GS8400 models. The GS8000 series servers were intended to be core servers that backed mission-critical client-server applications and presided over corporate-wide information management and processing. For this reason, Fujitsu marketed the models as global servers (GS). (1)Fujitsu used CMOS technology (0.35 micron process) instead of ECL*2 for the first time in its large mainframes. 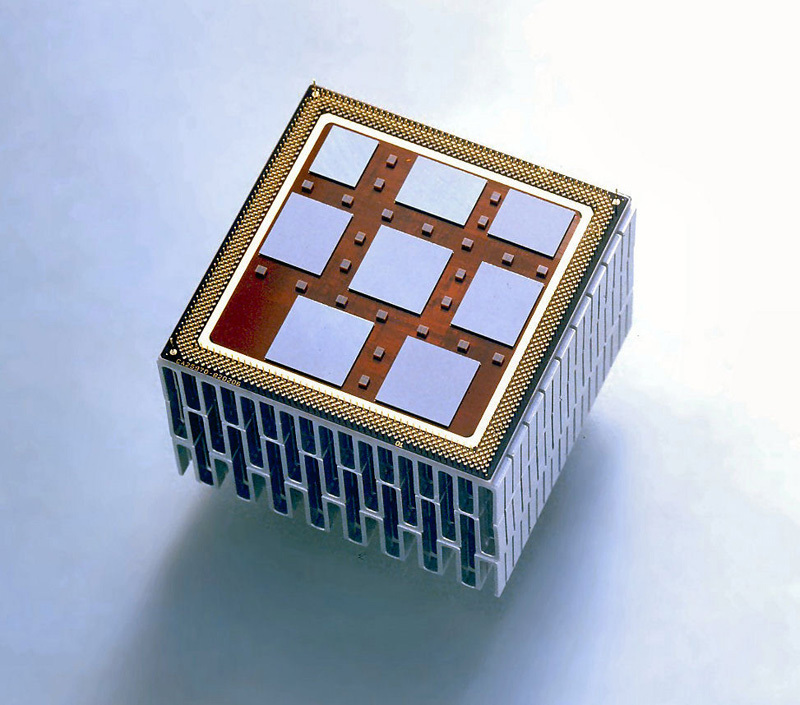 MCMs achieved higher mounting densities, which delivered better performance from the CMOS components. 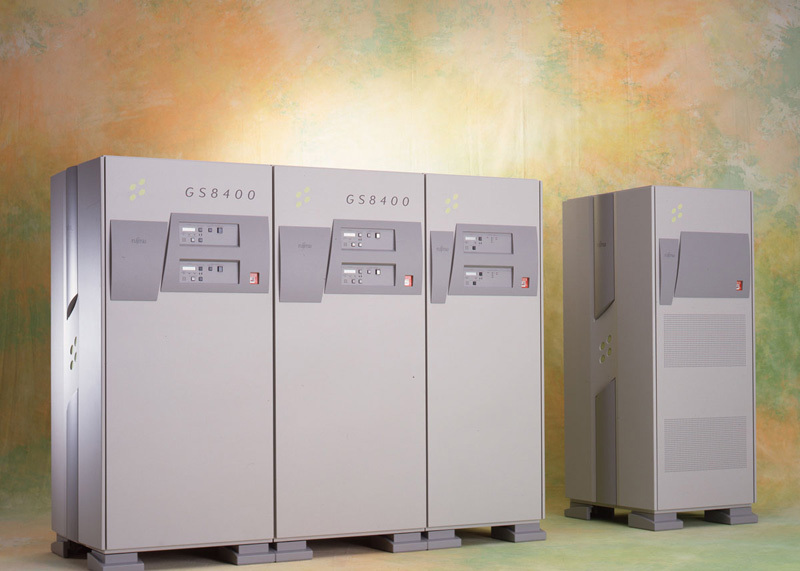 The GS8400 group covered a 64-fold performance range, from the entry-level model (GS8400/10Q) to the eight-node cluster model (GS8400/800). (4)Online servicing/expansion*5 on cluster models gave the reliability needed for core business systems. *1. CMOS: Complementary metal oxide semiconductor. *2. ECL: Emitter coupled logic. *3. MCM: Multichip module. A module that mounts multiple LSI chips on a single substrate. *4. 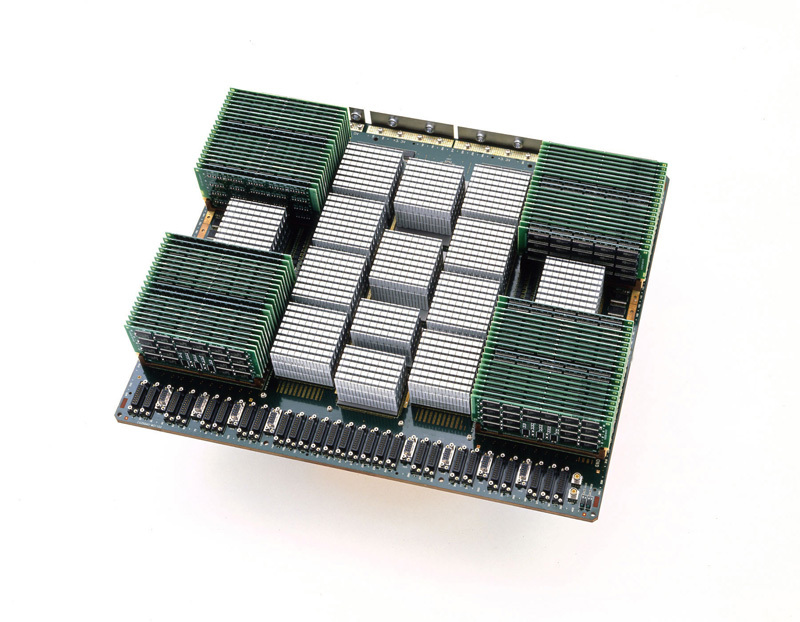 SCMP: SSU-Coupled Multiprocessors. SSU: System storage unit. A parallel-processing methodology first provided with the M-1800 model group (1990). *5. Online servicing/expansion: Ability to service (replace, etc.) or add components without stopping the computer. This technology is essential for 24-hour continuous computer operation. *Taking the performance of the GS8600/10 as the baseline. 512 MB max. 1 GB max. *Taking the performance of the GS8400/10Q as the baseline. 2 GB max. 4 GB max. 252 MB max. 380 MB max. *Taking the performance of the GS8200/10R as the baseline. The specifications above were correct at the time the products were announced. Some specifications were later revised due to product upgrades.